Smolyaninova O. G., Imanova O. A., Bezyzvestnykh E. A. Practices of using distance educational technologies (DOT) in training bachelors of pedagogical directions — future tutors — in Siberian Federal University are presented. The possibilities of DOT in the framework of the implementation of e-learning courses “E-Portfolio in personal and professional development” and “E-Portfolio technology” in the system of e-learning at the university are considered. The ways of organization of independent work of students by means of distance educational technologies and electronic portfolio are described. Keywords: distance education technologies, e-portfolio, teacher education, bachelor’s degree, tutor, students with special needs, inclusive education, individual educational trajectory, federal university. Zubrilin A. A., Chadina E. G.
The article describes the process of training future bachelors of pedagogical education for the Olympiads in informatics. As an example, Open International Internet-Olympiads are taken. The example of accompanying students of a pedagogical university in the field of Olympiad training in informatics from the first to the final course is given. Keywords: bachelor of pedagogical education, Olympiad in informatics, training for Olympiad. Erokhina E. A., Khruslova D. V.
Various methods of presenting the material in the course “Algorithmization of computations” are compared in the article. Essentially new methods and organizational forms of training are described, which are made available with the introduction of information technologies. Keywords: didactics, hybrid course, distance course, methodics, eBeam, Coursera. Golodkov Yu. E., Larionova E. Yu. The article examines some issues concerning the development of graduates’ competencies in the field of information security and data protection essential for the success of law enforcement in Russia. It is shown that provided by advances in information technologies for the quality training of law enforcement officers it is necessary to significantly expand their professional visibility in the field of information security. Keywords: information technologies, information security, professional competencies, quantum communication technologies. Verkholetova I. N., Ponachugin А. V.
The article deals with the problem of integration into the educational process of web-quest technology. A review of online services, platforms for creating and implementing web quests, revealing the functionality of services and demonstrating examples of the implementation of quests on their basis is given. The criteria for assessing the quality and adaptability of the platform for creating a web quest are formulated. Keywords: project technology, educational web-quest, online service, website, blog. The article considers the method of assessing general competencies using a group solution of situational problems and compares it with the method of assessing general competencies by self-assessment of students. Keywords: general competencies, self-assessment, FSES, group assessment method, peer review, competence level, practice-oriented training. The article discusses a few ways of how to solve probabilistic problems with the use of conducting a virtual statistical experiment. By the example of five ways to resolve the Bertrand paradox, we compare traditional methods based on geometrical modelling and a method founded on dynamic electronic visualization within an interactive software platform 1C:MathKit 6.0. Keywords: probabilistic task, electronic visualization, virtual environment, MathKit, 1C:MathKit 6.0, Bertrand paradox, probability theory. Latysheva L. P., Skornyakova A. Yu., Cheremnykh E. L.
The article describes the experience of training future teachers of additional mathematical education using the base of the information educational environment that operates on the basis of the Moodle system. Attention is drawn to methods of teaching mathematical disciplines of future bachelors and masters of teacher education. Keywords: additional mathematical education, electronic resources, Moodle, educational portfolio, distance technologies, mathematical disciplines. Theoretical and methodological foundations of the development of the information culture of future primary school teachers are considered in the article, description of the procedure of the development and experimental verification of the effectiveness of the structural-functional model of the development of the information culture of future primary school teachers in the higher education system is given. Keywords: information culture, future primary school teachers, information and communication technologies, educational process, structural-functional model. Bishutina L. I., Kubrak Yа. A., Ul’yanova N. D.
The requirement to store the data that is not used in the organization’s workﬂow brings the need for the correct organization of the archive and the activities of its employees. The workﬂow of the university have certain features, which require the automation of the archivist’s activity. 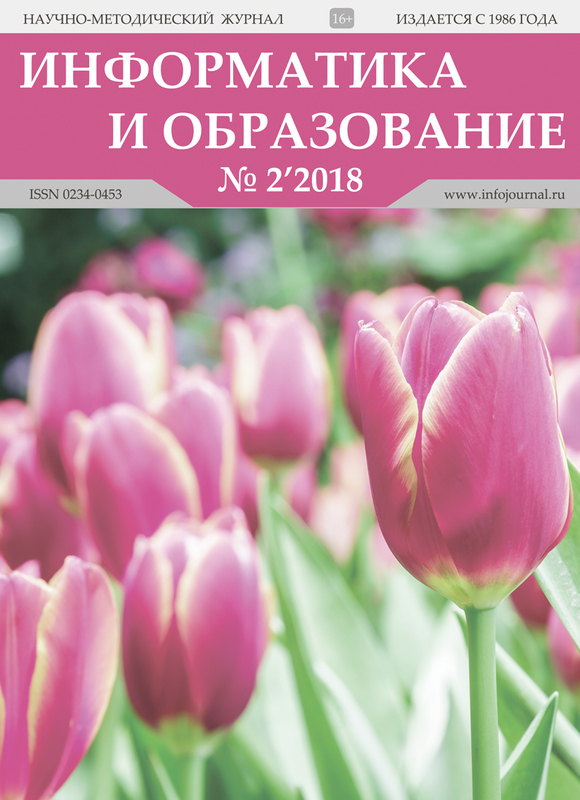 The article describes the information system for automation of archivist’s activity, its architecture and experience of its usage in Bryansk State Agrarian University. Keywords: archive, archivist, fact sheet, inventory of cases of permanent storage, inventory of personnel cases.